Please be patient... photos will take a few moments to download. Sunday, April 14, 2019. Palm Sunday of the Lord's Passion: Holy Week has begun! Click here for the album. Thursday, April 11, 2019. We gathered with the Archbishop and priests of the Archdiocese of Seattle for the annual Chrism Mass. Click here for the album. Saturday, March 30, 2019. Father Ryan celebrated the Sacrament of Reconciliation with children preparing to make the First Communion in May. Sunday, March 24, 2019. 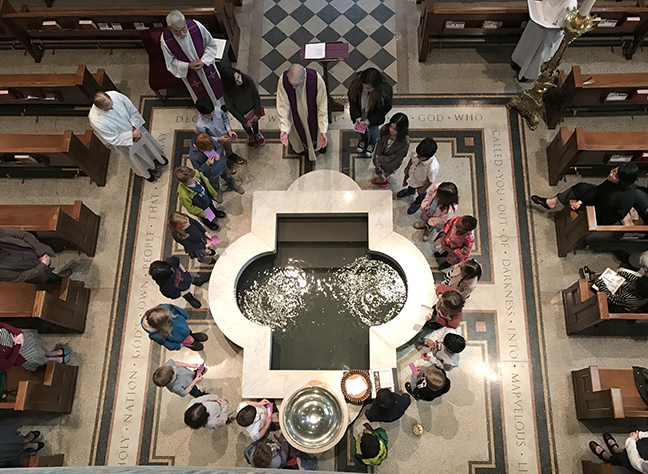 We celebrated the first of three Scrutiny Rites with our Elect, those preparing for baptism at the Easter Vigil. Saturday, March 23, 2019. We celebrated a special Mass with Archbishop Sartain and the Inclusion Ministry of the Archdiocese of Seattle. A joy-filled celebration! Thursday, March 7, 2019. We celebrated the Rite of Election with our catechumens and candidates. Here a young catechumen enrolls her name in the Book of the Elect. Wednesday, March 6, 2019. Ash Wednesday marked the beginning of the holy season of Lent. Thursday, February 14, 2019. A beautiful granite tombstone was placed on the grave of Archbishop Raymond G. Hunthausen, who was interred in the Cathedral crypt in August. On the right can be seen the tomb of Archbishop Thomas J. Murphy, who died in June 1997. February, 2019. For ten days, Seattle was in the grip of a winter storm which saw record-breaking snowfall. Sunday, January 20, 2019. Children carry flowers in the entrance procession to honor the holy child Jesus, the Santo Nino. Sunday, January 6, 2019. We celebrated the great feast of the Epiphany!